Purification of liver macrophages yields minimal T cell contamination. 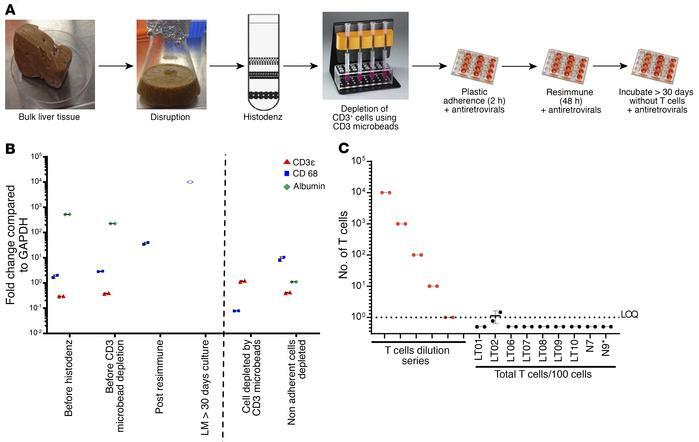 (A) LMs were purified from fresh liver tissue using a multistep protocol that progressively depletes T cells: bulk liver tissue was disrupted, centrifuged on a Histodenz gradient (Sigma-Aldrich), and followed by depletion of T cells using CD3 microbeads. Mononuclear cell fractions were incubated on plastic to separate adherent LMs from nonadherent cells and then incubated with Resimmune, a high-affinity T cell toxin, to deplete remaining T cells. LMs were incubated for more than 30 days, deprived of T cell mitogens, and maintained in the presence of antiretrovirals (ARVs) to prevent ex vivo infection. (B) The purification protocol depletes T cells. In a sample isolation of LMs from an HIV-1 uninfected liver, a sensitive qPCR assay for CD3ε mRNA showed the absence of detectable T cells. LMs and hepatocytes were also detected by qPCR assays for CD68 and albumin mRNA, respectively. The fold increases were compared with GAPDH. However, when GAPDH was not detected, as shown by the open blue box (CD68), fold-change was calculated by assigning GAPDH the last cycle number of the qPCR. (C) LM purification resulted in minimal T cell contamination in tissues taken from HIV-1–infected people. LM purity and T cell contamination were measured in duplicate on LMs isolated from 9 HIV-1–infected people before Resimmune and compared with a dilution series of total T cells. The protocol resulted in no detectable T cell contamination of LMs from 8 of 9 participants. In LMs from LT02, 1% T cell contamination was detectable, which was removed by maintaining the LMs in culture devoid of T cell mitogens for more than 90 days and treatment with Resimmune. The T cell dilution series represents the standard curve derived by performing qPCR for CD3ε mRNA on total RNA extracted from 10-fold dilutions of unactivated CD3+ T cells isolated by MACS separation from PBMCs obtained from a healthy donor. Error bars indicate mean ± SD. *For N9, there appeared to be PCR inhibition in the sample as indicated by poor detection of a housekeeping gene by qPCR.